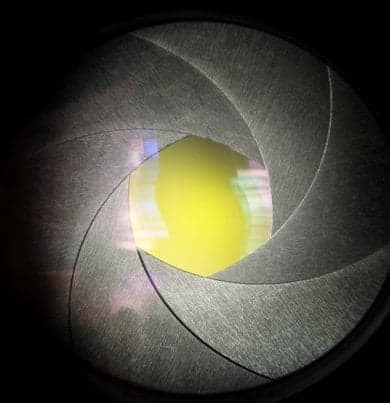 What is the Sharpest Aperture on a Lens? This article is a section in my 12 Photography Myths Article, where I explain what the sharpest aperture is on various lenses. As you can see from the samples and explanation below, the answer to the question of the sweet spot aperture for different lenses depends on what lens is used. My purpose in conducting this test is to show that there is no single sweet spot where each lens will be sharpest. Many photographers say that f/8 or f/11 is usually the sharpest lens, but I have not found that to be true. Other photographers say that the sweet spot is two stops from wide open, but that is also not true according to the tests I ran. It depends on each and every lens. The way that I did the testing for this article is to put the camera on a tripod and lock it down so there is absolutely no variable that could be impacting the test. Then, I taped a newspaper against the wall across the room and took various pictures of the newspaper. I used mirror lock-up (described in the 13 myths article), and I fired the camera wirelessly so that my pressing the shutter button would not vibrate the camera. I find that shooting a newspaper is a great way to test the sharpness because you can zoom in to 100% view of the words and easily see which picture is sharpest. I repeated this test multiple times for three common lenses: a wide angle, a 50mm prime, and a portrait zoom lens. The specific lenses that I tested were the Nikon 10-24mm lens, the Nikon 50mm f/1.8 lens, and the Nikon 70-200mm f/2.8 lens. I shot the zoom lenses at the most common focal length that I usually shoot the lenses at and shot at a distance that is common for shooting with the particular lens. OBVIOUSLY, the focal length of a zoom will change the sharpness. I have taken that into account by shooting at the most common focal lengths that I typically shoot these lenses at. While I, of course, tested every single aperture on these lenses, I only show a few of the most pertinent results here. Also remember that I am not saying that these apertures are the sharpest for every lens or even every similar lens. The sweet spot on lenses is totally dependent on the specific lens. Notice that f/13 is the sweet spot on this lens and f/16 is the highest aperture that still achieves reasonable sharpness. Wide angle lenses are most commonly used by photographers who shoot landscape photography. Since landscape photography usually demands high apertures to achieve full depth of field, I have shown the most relevant aperture tests to landscape photographers here (although I tested all the apertures, of course). Notice that f/13 is the sweet spot on this lens. However, many landscape photographers shoot at apertures higher than f/13 in order to gain more depth-of-field. Continuing up the line, the last aperture with what I would call acceptable sharpness was f/16. After f/16, significant diffraction can be seen in the photo which causes a reduction in sharpness. At f/22 (which many beginning landscape photographers tend to gravitate toward), the diffraction is very significant and sharpness is reduced dramatically. The tests reveal the answer to the problem. When shot at the most common apertures used on this lens (wide open), the lens is a horrible mess. It looks like someone has smeared grease on the lens! 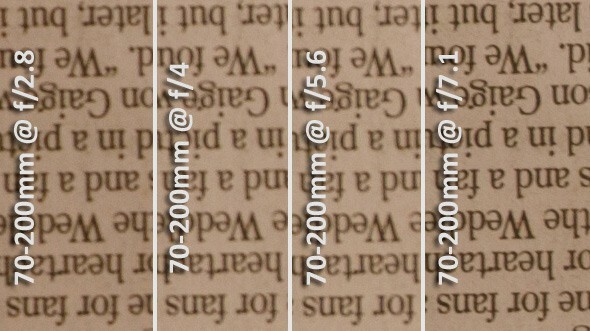 However, if you stop down to f/7.1, the lens is actually acceptable. Interestingly, even at unusually high apertures for this lens such as f/13, it is still reasonably acceptable. First of all, I have always found the 70-200 to be a very sharp lens, but when I compared it to the 50mm and the 10-24, I was blown away! The lens is extremely sharp. While the photos were all sharp from f/2.8 all the way up to f/18, I found that the sharpest aperture seemed to be f/7.1. Very interesting. The point I am trying to make in this article is that there is no way to tell what is the sharpest aperture of your lenses without simply testing it on your own lenses. The fable that f/8 or f/11 are usually the sharpest apertures simply is not true. In fact, f/8 was not the sharpest aperture on any one of the three lenses I tested. If this article was useful to you, LIKE Improve Photography on Facebook so you can get all our articles in your Facebook feed each morning.